Lucha Underground on El Rey at 8 p.m. ET has Prince Puma vs. Cage in a Boyle Heights Street Fight, Angelico vs. Son of Havoc, and Alberto El Patron vs. Texano in a Bullrope match. El Rey has promo and teaser videos on their YouTube channel. Official description from El Rey: Tonight, the Boyle Heights Street Fight Main Event Championship title match takes place, and with two world titles on the line, stakes are high. Cage and Puma don't let the pressure get the best of them, while Son of Havoc and Hellico go head-to-head in a beat down. However, it's the fight for the title of AAA Mega Champion that will separate the winners from the losers. Watch as Texano, the longest AAA Campion holder fights the current AAA Champion title, Alberto el Patron. Who will take home the belt this time around? Find out on Wednesday, March 25th at 8:00PM ET/PT on El Rey Network. 7:00 p.m. ET - New episode of UFC Tonight. 8:00 p.m. ET - Rerun of the middleweight title change timeline episode of UFC Unleashed. 9:00 p.m. ET - Rerun of the UFC Presents documentary about Chris Weidman. 10:00 p.m. ET - Rerun of the Anderson Silva vs. Chris Weidman I episode of UFC Fight Flashback. 10:30 p.m. ET - New episode of UFC Main Event featuring the Anderson Silva vs. Vitor Belfort fight from 2011. The newest issue of Figure Four Weekly is up on the site for subscribers (subscribe here) with a look at the current state of wrestling content piracy in light of recent developments like Tommy Dreamer's Facebook post and the arrest of WWE/UFC show capper "Sir Paul," as well as early notes on the death of Perro Aguayo Jr. and all of the usual reviews and international news. We've got a jam packed issue of news this week in the Observer, with the fallout of UFC 185 and the two title changes, The New Japan Cup and where the booking is going, the build toward Invasion Attack, more comments on the Bill DeMott situation in WWE, more on Rampage Jackson's Bellator contract and Scott Coker, under oath, goes through what happened in negotiations and why Bellator is suing, , plus we've got features on Larry Zbyszko and Tatsumi Fujinami and the WWE Hall of Fame, New Japan attempts to rebuild NOAH with a storyline that has gotten mainstream ink and the bus accident and problems leading to the Rey de Reyes show. Website subscriptions, which include access to both current and older newsletters as well as every audio show in the history of the site as low as $9.99 per month! The lead story covers UFC 185, the two surprise title changes, a look at the future for the fighters on the show, business notes on the show, early PPV notes, bonuses and match-by-match coverage with poll results. We also look at the New Japan Cup, as well as the Invasion Attack show, changes in the original card and why, plus other New Japan World shows coming up, and full coverage of the New Japan Cup finals, with match-by-match coverage, star ratings and poll results. We've got more on the Bill DeMott situation including more comments by different people, as well as DeMott's first defenses. We've got more from the deposition of Scott Coker on the Rampage Jackson lawsuit. We look at how much Jackson earned while in UFC, how much he had earned in his tenure in Bellator, business notes on Jackson's fights and how the relationship with Bellator fell apart, including Bellator's plans for Jackson going forward. We also look at the career of Larry Zbyszko, including notes on the WWE Hall of Fame ceremony, who is inducting who, how Larry Zbyszko started his career, what 90s feud was a copy of Sammartino vs. Zbyszko, a look at the feud, and why Zbyszko was never as hot again, how he got the AWA title, his lawsuit against WWE, what happened to Ray Stevens, notes on Tatsumi Fujinami, the politics of wrestling in the early 80s and where Fujinami fit in, the Fujinami vs. Choshu feud, the Fujinami vs. Flair matches and other WWE Hall of Fame notes. We also have an update on Brock Lesnar and where he currently stands as far as what is next, how much Vince McMahon, HHH and others earned this past year, who are WWE's biggest stockholders and how much of the company does Vince McMahon own, how much McMahon and HHH have earned the past several years, great incentives given for key WWE officials to stay, WWE video game notes, Notes on WWE ticket sales, WrestleMania ticket selling update, Vince's stolen car found, updates on Kevin Owens and Jey Uso, and why others missed shows this past week. We also look at fan behavior, DVD sales, lots of new WWE signees, WWE network changes, new WWE character, Cena movie, WWE night in Phoenix and Justin Gabriel talks leaving WWE. We also have lots of updates from NXT, NXT house shows, WWE house show coverage and business notes. We also look at Pro Wrestling NOAH's first major show of the year, how well it did, coverage, angle hints, booking of the show as well as match-by-match coverage. We also look at AAA's attempt to put on Rey de Reyes, the problems with the show, the bus accident, injuries in the accident and more. We also have more on PPV numbers for UFC, WWE and ROH. -- As noted earlier, WWE and TapOut finally announced their long-rumored deal. If there's a surprise, it's that they're not releasing WWE-themed TapOut clothing. Instead, WWE is partnering with TapOut to relaunch the brand as general purpose fitness clothing without the MMA theme, and that includes being the official fitness apparel company of WWE. -- Long-time friend of the site Houston Mitchell has an interview with Stephanie McMahon at the LA Times website. Most of it covers WWE's charity work with Connor's Cure and the Special Olympics. -- Note for those getting WWE Network specificially for WrestleMania: If you wait until tomorrow (or later, obviously), you also get Extreme Rules in your month. -- Fox Sports' The Buzzer got Dana White's immediate reaction to Brock Lesnar re-signing with WWE yeaterday. Nothing unexpected, but kind of interesting to watch. -- If you have $20,000 to spare, Abdullah the Butcher's WWE Hall of Fame ring is on eBay. Superstar Billy Graham had previously sold or tried to sell his own ring, as well, but that's it as best as I can remember. Could someone who knows the current wrestling collectible market let us know if he has any prayer of getting anything close to the asking price? -- UFC announced Kelvin Gastelum vs. Nate Marquardt for UFC 188, the Mexico City PPV in June headlined by the Cain Velasquez vs. Fabricio Werdum heavyweight title unification fight. This makes a certain kind of sense: Gastelum was forced to move up to middlewight for the time being, but he gets an opponent who has some small amount of residual name value while also being a guy on a downslide who has fought at welterweight. Plus Gastelum is a natural for this card since he made himself one of the biggest stars on the Meixco City debut card. -- Masked Republic announced a Perro Aguayo Jr. memorial t-shirt, and they're working with Damian 666, Perrito's long-time booker/right hand man in the Perros del Mal promotion, to make sure that profits going to the Aguayo family. Note that the design in the tweet is a placeholder; the shirt being printed is a variation of the Perros del Mal design that was a huge seller in Mexico. The shirt will be available at LuchaShop.com this weekend though delivery may take a few weeks depending on the demand. -- Clips of Roman'Reigns' appearance on Conan last night are up here and here. The full show is here, and Reigns comes on at the 31:30 mark. As expected, he was much better in this environment than he is doing scripted promos. 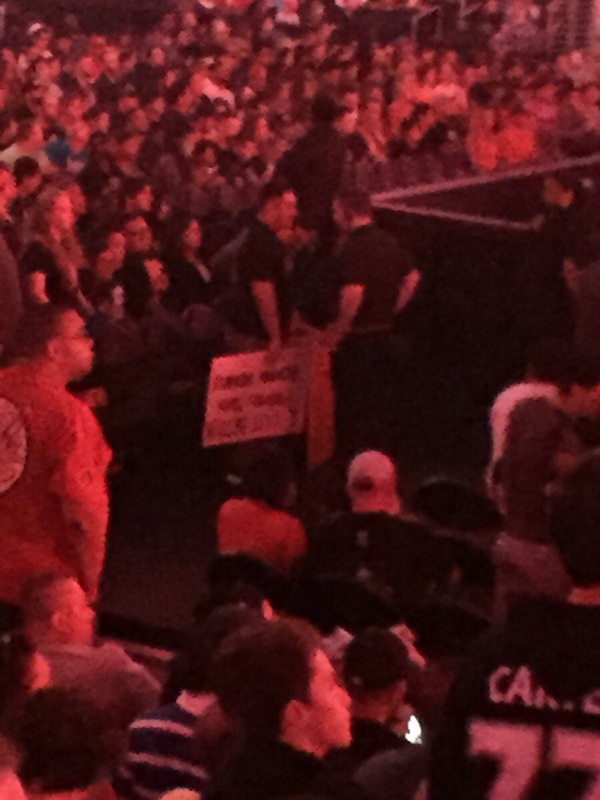 -- Meanwhile, though, a photo popped up of a anti-Reigns sign being confiscated at Raw this past Monday. -- Tickets for the May 16th "Evening with Jim Ross" in Baltimore go on sale this Friday. More details here. A piece from ysterday on the Lesnar news. And one from late last night/early this morning about the mixed messages from the ratings for Saturday's UFC card. -- My iTunes feed didn't go up until today, so if you use iTunes for podcasts, you can subscribe to The Trade Marks and my other new shows via this link or looking up "The Bix Show." -- New episode of Wrestling Culture with Dave Musgrave and (my Trade Marks co-host) Dylan Hales going over the WrestleMania weekend is now up. -- Micro Wrestling Federation Saturday March 28th - Start time at 9pm at J's Pub & Chasers Nightlife, 711 Osborne Street in St. Marys, Georgia - Tickets are $15 & $25. 31 years ago in 1984, the WWF held a rare (for the time) untelevised Madison Square Garden card, with just a handful of matches trickling out later on TV and home video. The card is probably best known for the Roddy Piper & David Schultz vs. Andre the Giant & Jimmy Snuka match, which was built off an Andre appearance on Piper's Pit and saw Andre get bloodied and escorted to the locker room, only to returned bandaged up a la Terry Funk. That match was masde available on the old "Roddy Piper's Greatest Hits" Coliseum Home Video release. Also on the card, Akira Maeda beat Pierre LeFebvre to win a tournament final for the WWF International Championship. It's been largely forgotten that with Hisashi Shinma leaving NJPW for the original UWF, which was a few weeks away from debuting, the WWF was also going to switch allegiances in Japan, but that didn't get much further than this match. For the most part, the rest of Maeda's American tour, where he had been promised a push as champion, consisted of him doing jobs in prelims, including a televised loss to George "The Animal" Steele. 25 years ago in 1990, The Ultimate Challenge, the "go home" special previewing WrestleMania VI (these shows replaced Prime Time Wrestling that week) aired on USA Network. The main event was something of an oddity, WWF Tag Team Champions The Colossal Connection (Andre the Giant & Haku) defeating The Rockers (Shawn Michaels & Marty Jannetty) by DQ, while the show opened with Ted DiBiase going over The Red Rooster, better known as his former Mid-South rival Terry Taylor. In the other matches, Dusty Rhodes beat Randy Savage by DQ, Earthquake beat Ron Garvin (who was quickly being reduced to the level of a TV job guy after winning his feud with Greg Valentine), and The Big Bossman beat Boris Zhukov. 20 years ago in 1995, an episode of WWF Superstars aired that included The Smoking Gunns defeating Rip Rogers & Chic Donovan, which is, on paper, the most amazing match in wrestling history.